The producers of this project have gone to town with formats, and there are actually five different purchasing options including 2CD, 2CD+DVD, triple vinyl, a 4LP coloured vinyl box set and a limited deluxe box (1000 only) which combines coloured vinyl, CD, DVD, a Höfner bass guitar USB, and various art prints. The two box sets have 42 tracks - McCartney compositions from all eras including The Beatles, Wings and solo work. The other formats have 34 songs, except the 2CD+DVD via bought via Amazon, which has 2 bonus tracks (C Moon - Robert Smith and Put It There - Peter, Bjorn & John). In case you're wondering those two tracks are amongst the eight ‘extra' tracks found in the pricey boxes (i.e. they're not unique to this amazon edition). 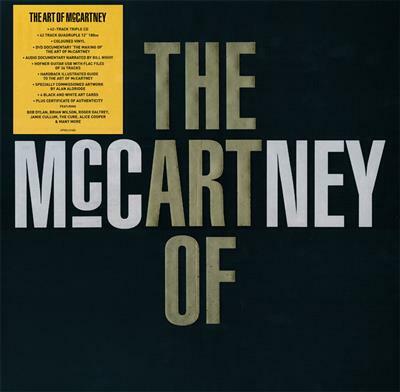 The deluxe box set includes the the two CDs and DVD from the cheaper set but adds a bonus CD with 8 further tracks and a fourth CD that features "The Making of The Art Of McCartney" an audio documentary about the making of the album narrated by Bill Nighy. You also get a 64-page hardcover book, artcards, four coloured vinyl records, the bespoke Hofner USB and hand numbered certificate of authenticity.